2017.gada 11.-12.novembrī Jēkabpilī notika VII Jēkabpils sporta skolas trenera Jāņa Mileikas piemiņas šaha sacensības (“A” un “B” turnīri - Šveices sistēma, 9 kārtas, laika kontrole – 8 min. + 4 sek., "C" turnīrs - Šveices sistēma, 2 x 7 kārtas, laika kontrole – 3 min. + 2 sek. ; FIDE reitinga aprēķins). Place: Sigulda State Gymnasium, K.Barona iela 10, Sigulda, Latvia. System, time control: 11 rounds Swiss system, FIDE rules, FIDE rapid chess rating calculation. Time control 12 min/game + 5 sec/move. Chief arbiter has the right to make changes. Tournament is open for all chess lovers who have FIDE ID number. The VII International Chess Festival „RIGA TECHNICAL UNIVERSITY OPEN 2017” - August 7-13, 2017, Riga, Latvia. Five main ELO tournaments and an additional blitz tournament; the total prize pool of the festival - 20 000 EUR. Chess Festival "Liepajas rokade - 2017"
Chess Festival "Liepajas rokade - 2017": August 3 - 6, 2017,(SIA “Liepājas Latviešu biedrības nams”, Rožu laukums 5/6, LIEPAJA, LATVIA). Total Prize Amount: 7000 EUR. - Saturday 5 November 2016: ELO-rated 9-round Swiss Rapidplays, G8+4 (13:30-18:00), Section A: OPEN, Section B: max ELO 2000; 19:00 - Table tennis tournament and chess lecture. - Sunday 8 November 2016: 10:00 - Laying flowers at the grave of Janis Mileika (Bus from the tournament hall), ELO-rated 7 double-round Swiss Blitz, G3+2 (10:30-14:00, Play two games with each opponent alternating colours). International chess festival “Jurmala Chess Days”: February 26 – March 5 2017, “SemaraH Hotel Lielupe”, Jurmala, Latvia: 7 tournaments (including Mikhail Tal Memorial and Alexei Shirov Winter Cup). The VI International Chess Festival „RIGA TECHNICAL UNIVERSITY OPEN 2016” - August 8-14, 2016, Riga, Latvia. Four main ELO tournaments and an additional blitz tournament; the total prize pool of the festival - 18 600 EUR. Chess Festival "Liepajas rokade - 2016"
Chess Festival "Liepajas rokade - 2016": August 4 - 7, 2016, hotel "FONTAINE ROYAL" (Stūrmaņu iela 1, LIEPAJA, LATVIA). Total Prize Amount: 7000 EUR. Venue: Hall College Panevezys, str. Klaipedos 3. The festival featured leading Latvian grandmasters as well as a few strong grandmasters and chess lovers from all around the world. Tournament A is 12 round Swiss with the time control 15 minutes for each player plus 5 seconds increment for each move. The total prize fund is 15200 EUR. Tournament B is reserved mainly for players rated 1800-2349. Swiss system, 10 rounds. Tournament C is reserved for players rated less than 1800. Swiss system; 10 rounds. The Blitz Tournament was held March 4 at 17:00 in the Amber Beach resort (Jaunkemeri). The time control - 3 minutes plus 3 seconds for each move starting with the first move; 11 rounds. Prize fund 2150 EUR. Attention! The games on first ten boards will be electronically transmitted and recorded. If a player does not wish to play on the DGT boards, he should advice it to the chief arbiter before the 1st round. The Organizers reserve the right to deduct up to 50% of the player's prize money in that case. * The organizers recommend accommodation at the 3* Dzintars hotel www.dzintarshotel.lv Room rates for the accommodation with breakfast start from 40 Euros. Please contact the organizers if you wish to get better rates than those available on internet. The event was held in two age groups - under 14 and under 10 as individual Swiss but with team rank as well (Each team consists of 3 boys and 1 girl. The participation of one reserve boy and girl in each team is possible. There are 7 rounds in each group (both are FIDE rated). Tie brakes: In case of ties the following tie brakes are used: 1) Mini Buchholz, 2) Buchholz, 3) Rating performance. Place and Time - Competition will be held on 3rd and 4th October, 2015 at Sigulda State gymnasium, K.Barona iela 10, Sigulda, Latvia. System, time control - 11 rounds Swiss system, FIDE rules, FIDE rapid chess rating calculation. Time control 12 min + 5 sec/move. On Saturday, October 3 registration of players from 13.00 till 13.50 and will be played 6 rounds from 14:00 until 19:15. On Sunday, October 4 will be played 5 rounds from 10:00 until 14:30. The V International Chess Festival „RIGA TECHNICAL UNIVERSITY OPEN 2015” - August 10-16, 2015, Riga, Latvia. Four main ELO tournaments and an additional blitz tournament; the total prize pool of the festival - 20 000 EUR. Chess Festival "Liepajas rokade - 2015"
Chess Festival "Liepajas rokade - 2015": August 6 - 9, 2015, hotel "FONTAINE ROYAL" (Stūrmaņu iela 1, LIEPAJA, LATVIA). Total Prize Amount: 6 200 EUR. The festival featured leading Latvian grandmasters as well as a few strong grandmasters (such as Ivanchuk, Karjakin, Morozevich, Rapport and so on) and chess lovers from all around the world. Tournament A is 11 round Swiss with the time control 15 minutes for each player plus 6 seconds increment for each move. The total prize fund is 12900 EUR. The Blitz Tournament was held March 6 at 16:50 in the Amber Beach resort (Jaunkemeri). The time control is 3 minutes plus 3 seconds for each move starting with the first move; 10 rounds. Prize fund 1700 EUR. The event will be held in two age groups - under 14 and under 10 as individual Swiss but with team rank as well. Each team consists of 3 boys and 1 girl. The participation of one reserve boy and girl in each team is possible. There are 7 rounds in each group (both are FIDE rated), time control is 90 minutes per game plus 30 seconds increment per move. THE PRELIMINARY TOURNAMENT was a Swiss system 7-round rapid chess (15+15 minutes + a 5-second increment) tournament in one group. THE MAIN TOURNAMENT was a 9-round rapid chess (15+15 minutes + a 10-second increment) round robin tournament. 5 participants, including at least 2 from Estonia, - from the preliminary tournament, and 5 was personally invited. CHESS CONGRESS DRUSKININKAI 2015 (Druskininkai, Lithuania, January 9–11, 2015) - 2 Rapid and 1 Blitz chess tournaments (9 rounds, Swiss system) + international chess training camp). 2014 Universiade is open to players from all Latvian universities, as well as from other European universities. 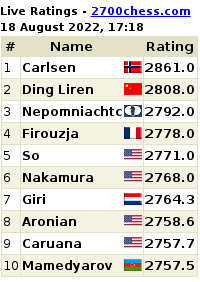 Each school is allowed to enter up to 5 men and 5 women with no lower than 1600 FIDE rating. The competition takes place in accordance with the rules of FIDE rapid chess playing 7 rounds in the Swiss system. Representatives from the same university shall not meet among themselves. Time control - 25 minutes until the end of the game, each participant + 5 seconds for each move made. The tournament will calculate rapid chess FIDE rating. Competition was held on 4th and 5th October, 2014 at Sigulda State gymnasium, K.Barona iela 10, Sigulda, Latvia. Preliminary application until Wednesday, 1st October, 17.00. 11 rounds Swiss system, FIDE rules, FIDE rapid chess rating calculation. Time control 12 min + 5 sec/move. Chief arbiter has the right to make changes. Venue: Panevezys Kolegija, Laisvės square 23. System and rate of play: 9 rounds, played in the Swiss system in accordance with the FIDE Laws of Chess. The playing time will be 90 minutes for 40 moves plus 30 min. to end game with 30 seconds cumulative increment for each move starting from first move. FIDE rated. Chief Arbiter IA Raimondas Paliulionis. The team tournament - according to the Swiss System in 7 rounds. Time control: 90 minutes per game per player + 30 seconds per move starting from the move 1. 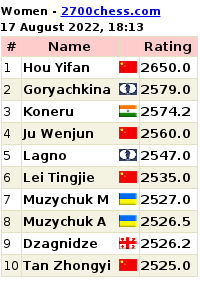 (Only FIDE ratings for the pairings). Fund of individual board prizes - 1000 EUR. The international Baltic Summer Chess Camp (www.chessbaltic.com) held in Riga during August 13-16. It was an intensive and enjoyable training which will invigorate the chess practice of the children and adults with ELO below 2014. Participants from Latvia, Lithuania and the UK improved their chess skills and enjoyed Riga city (charming European Capital of Culture for 2014) celebration. City tour was held and participants were able to spend time wandering around the pleasant Riga Old Town exploring its markets, cafes and museums. The event was conducted in English which provided welcome cross-cultural and language experience for the participants. Main trainer Verner Putka used a variety of teaching methods including lectures, game analysis, memory recall, exercises, consulting and pair games, simultaneous. Fried Liver attack against the Two Knights defence was illustrated by the topical game Shirov (Latvia) – Sulskis (Lithuania) from the recent Tromso Olympiad which Shirov won in swashbuckling style. Ričardas Fishmanas, the Lithuanian coach, presented some rare lines in the Kings Indian Defence. On the third day, Girts Kazmins navigated through the inevitable Latvian Gambit and showed it to be a dangerous weapon against the unprepared opponent. Valentin Kirilov, trainer of 8th World Champion Mikhail Tal, told about chess Heritage and showed a lot of personal materials. Participants were able to improve international chess ratings by playing in the local tournaments, including number of www.rtuopen.lv . Grateful acknowledgement is due to those who supported the UK participants including Chess in Schools and Communities for its award grant to Megan Richards (Cardiff), as CSC Pupil of the Year; the John Robinson Youth Chess Trust for its grants to Michael Green (Canterbury) and George Harman (Manchester) and for the donation of prizes. Training take place in charming chess club ROYAL BIOGRAPHY, located in the historical center of Hanseatic Riga, thank you to the owner – Dainis Deglis. The BSCC 2014 achieved what was intend, was value for the money and all participants would like to return next year. Dr. Yuri Agafonov, FIDE Trainer.